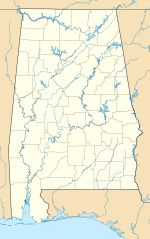 Atmore Municipal Airport (FAA LID: 0R1) is a city-owned public-use airport located 3 nautical miles (6 km) east of the central business district of Atmore, a city in Escambia County, Alabama, United States. According to the FAA's National Plan of Integrated Airport Systems for 2009–2013, it is categorized as a general aviation facility. Atmore Municipal Airport covers an area of 43 acres (0.07 sq mi; 0.17 km2) which contains one runway designated 18/36 is 5,209 x 80 feet (1,588 x 24 meters) asphalt pavement. For the 12-month period ending February 26, 2007, the airport had 3,870 general aviation aircraft operations. In 2017, the city of Atmore extended the runway length to its current length of 5,209 feet from its previous length of 4,950 feet.